Comfort in the palm of your hand! Place your online order below!! Maximum flow limit: secondary water conservation feature that lets you set the on/off lever so that it can't be opened any further that you have specified. Twin ceramic discs and washerless control - An end to the dripping faucet! Over ten years ago, Mattsson pioneered the introduction of ceramics instead of rubber as seals in faucets. Rubber washers work fine when they are new, but quickly deteriorate and are the major cause of dripping faucets. The answer was found in the development of ceramic discs that have been polished to an extraordinarily fine finish. This finish is so fine that water cannot pass between the two discs and flow is 100% controlled. Every component in a Mattsson product is made from the best materials available in the world. 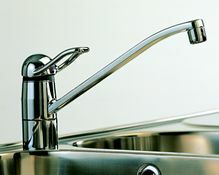 Faucets are cast in the most modern casting and finishing plant in the industry. The solid brass components of all Mattsson products are polished to a mirror finish and are then chromium plated to create the beautiful and practical finish that is so ideal. 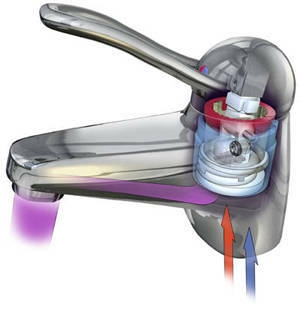 9100-0000 Chrome: Water conserving single lever galley faucet with anti-scald "child safety stop and ceramic disc technology. Simple, sleek and heavy duty! Spare Parts: 5911-0000 replacement cartridge for 9000 series faucets: spare part to carry aboard for repair.